The index opened positive above 8700 and stayed strong throughout the day with the only dip below 8700 bought with ease. The index closed at 8729.50, gain of 33.90 points. The broader market though was negative, with 627 advances to 917 declines. The range as per OI Table is 8500-8900 till Expiry. Call option 8800-9000 added huge 8.33 lacs OI with short covering seen at 8700 and lower strike prices. Put option 8800-8600 added huge 21.44 lacs OI with profit booking seen at 8500 and lower strike prices. 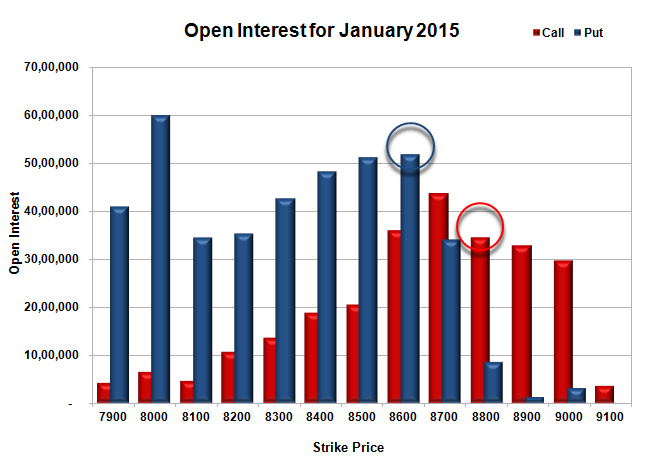 Nifty Open Interest is at 2,21,99,875 up by 4,65,275, with increase in price, most probably huge long build-up. 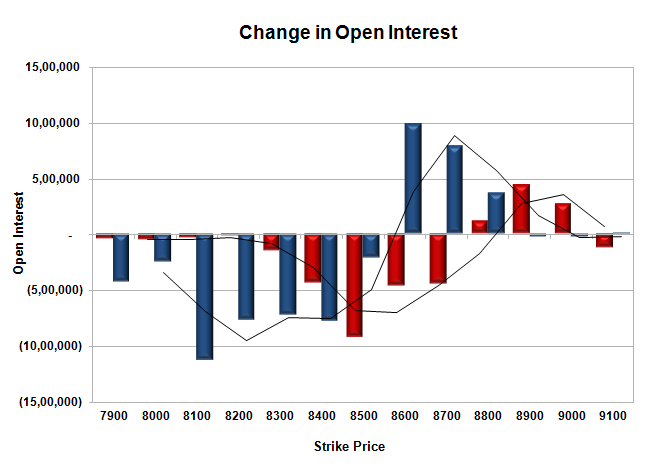 Bank Nifty Open Interest is at 20,38,250 down by 1,40,850, with increase in price, most probably huge short covering. FII’s bought huge 7.00 lacs Futures, which includes 43639 contracts long build-up and 15634 contracts short build-up, with increase in net OI by 59273 contracts (includes 89857 longs to 61852 shorts for the day) and the Average Price comes to 9033.02. FII’s Index future open contract as on date is 748527 Longs to 130329 Shorts, net long 618198 up by huge 28005 contracts. Initial support now at 8700, with huge OI addition of 7.89 lacs for the day and below that at 8600 with OI of 51.91 lacs. Initial and best resistance at 8800, with OI of 34.56 lacs and above that at 8900 with OI of 32.92 lacs. 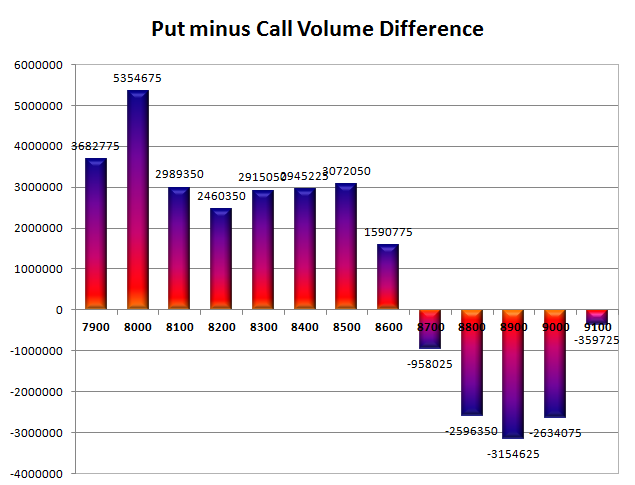 Day Range as per Option Table is 8642 - 8801 and as per VIX is 8649 - 8810 with 8720 as the Pivot.